Is the Android Wear-powered LG G Watch finally a wearable worth owning? We've been waiting a while for Android Wear to land and it's finally here thanks to the LG G Watch and Samsung Gear Live. Following in the footsteps of the likes of the Samsung Galaxy Gear, Samsung Gear 2, Samsung Gear 2 Neo and Pebble Steel, this device is the maker's latest attempt at drawing us into the wearables market. With smartphones increasing in size all the time - just look at the big-screened LG G3 - the argument is that it's easier to keep track of your notifications on your wrist than having to take out your giganto-phone every times it beeps. 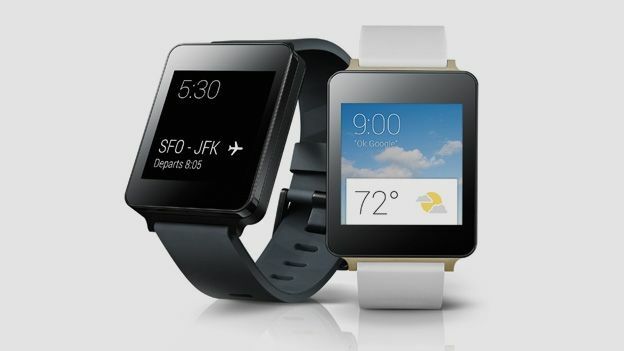 The LG G Watch measures 37.9 x 46.5 x 9.95mm, weighing 63g and featuring a 1.65-inch screen. That's slightly bigger and heavier than Samsung's Gear Live, LG's main Android Wear competitor at this stage, which has a 1.63-inch screen and weighs only 59g. Compared to standard (non-Smart) watches, the LG G Watch feels relatively big and heavy, and looks bulky on smaller wrists. The watch comes in two colours: 'Black Titan' and 'White Gold'. The former features a black trim around the watch and comes with a black strap, the latter boasts a gold trim and a white strap. Both models are sleekly designed - there are no buttons nor even an LG logo to be seen. The plastic strap could induce sweating in hot weather, but in the much-loved tradition of Android customisation, the strap is replaceable on both models using any 22mm band. We reviewed the Black Titan model, which is the more understated of the two models, and also pairs well with the maker's flagship LG G3. It's worth noting, however, that the watch will work with any Android device running software version 4.3 or above. LG's G Watch boasts a lot of features seen from other smart watches and fitness products, but we've rarely seen them all in one package. There's a pedometer so you can track your steps and set targets to improve your fitness. If you are a fitness fanatic though, Samsung's Gear Live also boasts a heart-rate monitor, which is a useful feature for setting fat-burning targets during exercise. LG's watch is also IP67-certified water and dust resistant, which in plain English means it's protected against water immersion for 30 minutes between a depth of 15cm and 1m, and is totally dust resistant. LG's official marketing video shows someone using the watch in the shower, but we'd be reticent to do this ourselves, if only because there's a hole for the microphone on the underside of the watch face. Google's Android Wear platform places a heavy emphasis on voice control - whenever the watch screen is on, you can tap the top right corner of the screen or say 'OK, Google' to activate voice commands. This feature works exactly the same way as it does on the full version of Android - you can ask the watch questions ('Who won the World Cup?') open apps on your phone ('Open Spotify'), check your agenda ('What does next week look like?') or provide navigation assistance ('Direct me to the London Eye'). As regular users of natural-language voice search will know, the service can occasionally let you down, but overall it's an elegant solution for a device where screen space and buttons are limited. In fact, the main issue is overcoming the social awkwardness of talking to your watch. There's no speaker on the LG G Watch - new notifications are alerted via vibration instead. The watch also boasts a gyroscope and accelerometer, which it uses to sense when you're raising the watch to look at it. We found this feature didn't work that well - it only seemed to activate when the watch was held at a 90-degree angle, when 45-degrees feels far more comfortable. Finally, the watch also boasts all the features you'd expect from a modern smart device, such as downloadable firmware updates, Bluetooth 4.0 and a compass. LG's 1.65-inch IPS display boasts 280 x 280 pixels. That's not a particularly high resolution, but images are colourful, text is easy to read, and at its highest brightness setting, it's good enough to use in bright sunlight. LG's screen doesn't compare favourably to Samsung's Gear Live though, which packs 320 x 320 pixels into its slightly smaller 1.63-inch SuperAMOLED screen. There are no buttons on the LG G Watch, so all physical interactions take place through the screen. The watch is activated by touching the face, at which point the time and the most recent notification is displayed. You turn the display off by covering the face with your hand. Unfortunately, it's relatively easy to unintentionally activate the screen if you're wearing short sleeves, such as folding your arms or putting your hands in your lap at somewhere like the cinema. There are 24 watch faces to customise your watch with, and there's a varied and fashionable selection of styles, from colourful Pop Art to more traditional analogue faces. Sadly, video playback doesn't seem to be a feature of the device at launch, although that appears to be a limitation of Android Wear, rather than the LG G Watch. The LG G Watch runs Android Wear, a new version of Google's Operating System designed specifically for watches and wearable technology. The general functionality of the device closely resembles Google Now, the personal assistant app that's been baked into Android since version 4.1. The general idea is to deliver you information as you need it. For example, if you have a meeting in your calendar, Google Now will figure out how long it will take for you to get there, and give you an alert telling you when you need to leave. If you've recently received an email with a dispatch notification, Google Now will tell you so you remember to be around to accept delivery. If you have a favourite football team, Google Now will notify you when they're playing. It's slightly disconcerting to see an Operating System predict your movements and interests so accurately, but once you get used to it, Google Now is a really useful feature. By heavily incorporating Google Now, Android Wear should be fairly familiar to anyone who's used Android on a phone or tablet. There are other features too, of course. Android system notifications are sent to the watch, so you can stay on top of incoming activity while your phone is in your pocket. Reading emails and texts on the watch soon becomes second nature, although responding to anything that requires more than a few words can be cumbersome using voice commands. Setting up the LG G Watch is quick and simple - you download the Android Wear app on your device, activate Bluetooth and sync them up. Developers are also able to update their existing applications to work with Android Wear - at the time of writing, 32 such apps were available on the UK Google Play store. Our favourites were Allthecooks Recipes, which informed us that 'Tomato season is finally here', Evernote, which allowed us to take voice dictations, and The Guardian, which delivered the latest news headlines. As you may expect at this early stage, Google's own apps tend to be slightly better integrated into Android Wear than third-party ones. For example, if you ask your watch to navigate you to a certain destination, the phone will work out the route, but the watch will display turn-by-turn notifications. The Twitter app is much more limited by comparison - you can view Tweets on the watch, but you can't retweet them from the watch. We expect such functionality will be introduced over time, but right now, some apps can be quite limited. Unlike earlier Smart Watches like the Sony SmartWatch 2, the LG G Watch is fast, slick and easy to use. The watch's 512MB memory and 1.2GHz Snapdragon 400 Processor may not sound powerful, but they're more than enough. Perhaps most miraculously, we didn't encounter any slowdown or a single crash during our test. Likewise, the 4GB internal storage doesn't sound like much and it isn't expandable, but you can't store anything on there apart from apps, so it's plenty for now. LG boasts that its G Watch eclipses the competition when it comes to battery life. Its 400mAh battery is a indeed much bigger than Samsung Gear Live's 300mAh model. Not only that, but LG claims its Chem division optimised the battery so that it can run for a quoted 36-hour span, compared to Samsung's which offers 'around a day' of use before needing to charge. Like most battery-powered technology, your mileage will vary according to use. On the default settings, the watch always shows the time, which means the display is always on and that drains the battery considerably. As a result, we got 31 hours, 24 minutes of use before having to charge it. Turn this option off in the settings and battery life more than doubles - we got just over 64 hours out of the device. You can also engage aeroplane mode for those times you really need to conserve battery. The LG G Watch includes a proprietary dock for charging. It connects to power via micro USB, so chances are you'll always have a cable around, and it's magnetic, so the watch snaps into place easily. It connects to the watch using five brass pins, and charges the device quickly - 80 per cent in 58 minutes, and a full charge in 78 minutes. However, the dock is another thing you'll need to carry with you when travelling, and the base is coated with a sticky substance that picks up dirt and hair easily. We've been waiting a long time for a Smart Watch to deliver, and while Android Wear certainly does as a platform, the LG G Watch isn't the best implementation of it at launch. It's slightly disappointing, because it's one of the best Smart Watches ever made - it's simple, powerful and fun to use, with plenty of genuine utility in daily life. However, it doesn't compare favourably to other Android Wear devices - Samsung Gear Live has a higher resolution screen and heart-rate monitor, while the upcoming Moto 360 appears to be more stylish. Android Wear is a great platform, and the LG G Watch demonstrates it well, but we'd recommend looking around at the competition before diving in.